Yesterday I went over to the school to help with a mural. By the time I got there, they were just cleaning up the finishing touches. A classic, “Here let me help you with that…What? You’re all done? Just finished? Well, good job, everybody!” moment. As I stood admiring everybody else’s hard work, Isaac walked by with his class and invited me to lunch. How could I say no? They eat in the gym, at long tables, and it smells like every cafeteria ever: of mushy green beans, something fried, bleach, and kids who have been running around in the sun. And it’s loud! They’re all so excited to be there, and there is decidedly more chattering than eating. Isaac, the boy who won’t eat peanut butter and jelly or bagels or “regular” cheese sandwiches ate his current lunch of choice: goat cheese on pita bread and raw red peppers. The kids who bought lunch dipped their spoons in their macaroni and cheese and smeared it on the trays and tables, but didn’t eat too much. I think nobody ate the green beans. I don’t think they’re meant to be eaten. It was sticker day, and whoever had a sticker on their tray got a prize. The children looked and looked again, sure that this time they’d find a sticker under their paper carton of pasta, though it hadn’t been there seconds before. The winner was announced…Pablo. Isaac’s friend sighed and said, “I wish I could be Pablo just for one day.” When Pablo walked triumphantly back to his seat he was mobbed by kids who wanted to see his prize. A pencil!! A whole pencil! The boy across from me said, “I saw you at the liquor store,” and I wasn’t sure how to reply. Sure, I go to the liquor store from time to time, I mean, I don’t hang out there, but I’ve been known to buy a bottle of wine every once in a while. Isaac, who is famous for his tin foil art, made me a big cuff bracelet out of his sandwich-wrapper. It looked like a swallow. His friend said he could probably sell them, he could probably start a business of making bracelets out of tin foil. I’ve been thinking a lot about Isaac lately, and envying his spontaneous creative spirit. I feel like I work so hard sometimes to find the right words. I’ll spend a whole afternoon writing two sentences. Isaac, he just has an idea and he makes it, be it a tin foil sculpture or a drawing or a poem. 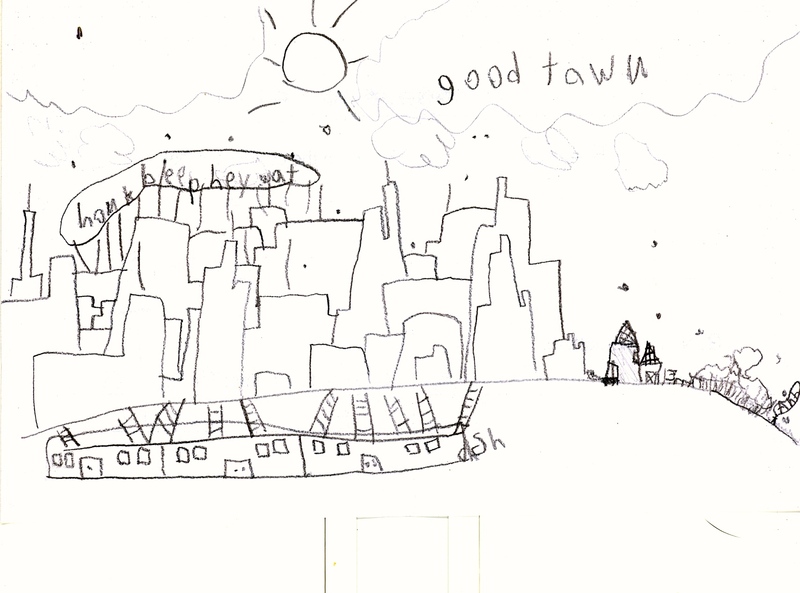 He has to write sentences and stories with his spelling words, and because they very often rhyme, there’s always an easy poetry about them. I shook it off/I stood there, by the tree/he stood here, in the soot. A near letter! I love that. So your lesson for today, children, is that it’s exciting to find a sticker on a tray and win a prize, no matter what that prize may be, and it’s important to dive right in and make what’s in your head, no matter how it may turn out. This is a really simple dish. Almost too simple to write about, except that it’s so good. It’s just tiny potatoes roasted with olives, in olive oil, with rosemary, salt and lots of pepper. Roasted olives are lovely…tender and flavorful and a little crunchy. Isaac loves them. 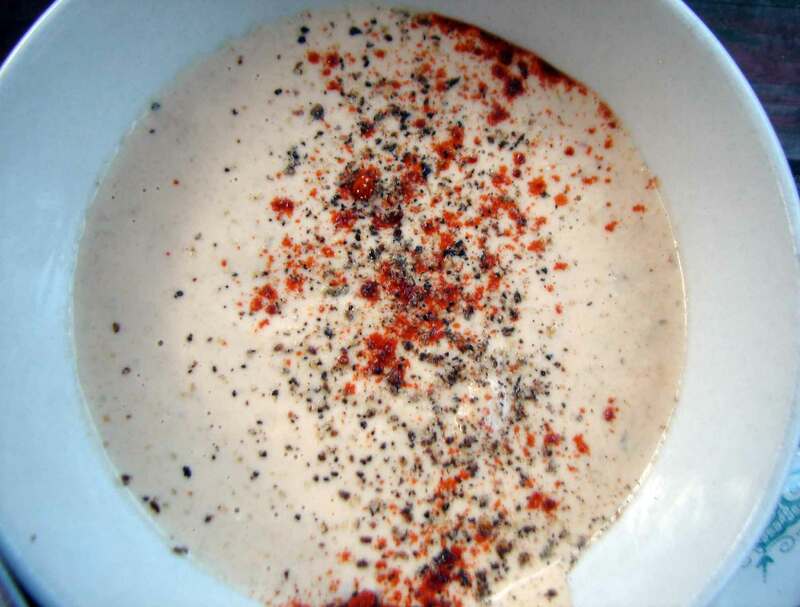 You could add other herbs, if you liked, or a splash of balsamic vinegar or lemon. Here’s Do It by the Beastie Boys. Every day lately, Malcolm has wanted nothing but to go to the river. The river! He wakes in the morning and thinks about walking down to the river, he wants to spend the long hot afternoon there, he wants to go back after dinner when the sinking sun makes a bright path on the darkening water. He and Clio splash in like some sort of mythical dolphin-otters, she bounds after sticks, and he dives for stones. When we walk home he’s bright and wet and barefoot, and he has an armful of rocks swaddled in his soaking shirt. 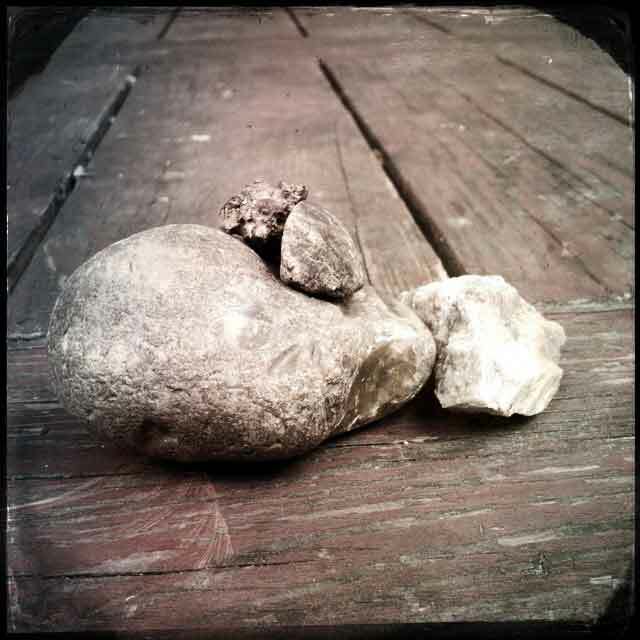 Our house is full of stones! 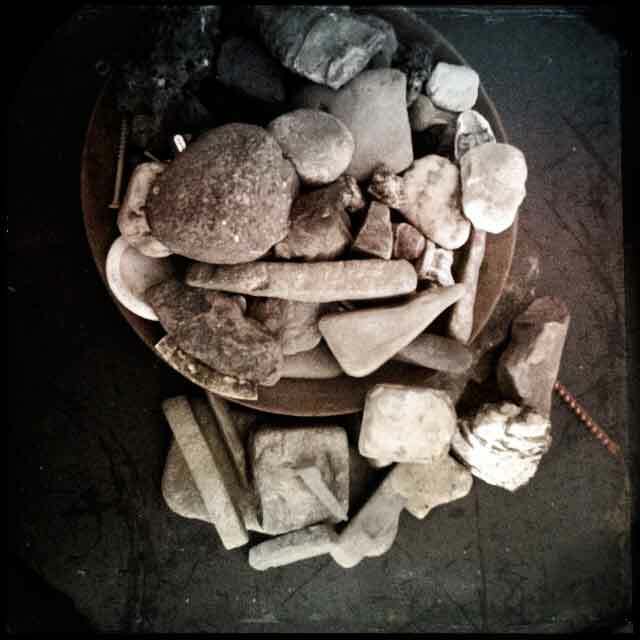 River stones, creek stones, pebbles from the seaside. Smooth black stones, dusky grey stones, pockmarked stones, and craggy striated rocks, stones that were slick and beautiful when wet, and now seem dusty and plain, but still worth keeping. 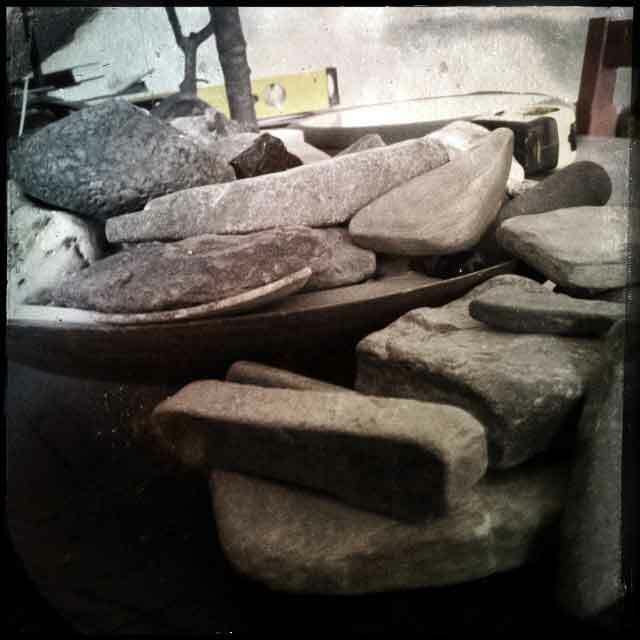 We have a wooden bowl on our kitchen table spilling over with stones of every size. 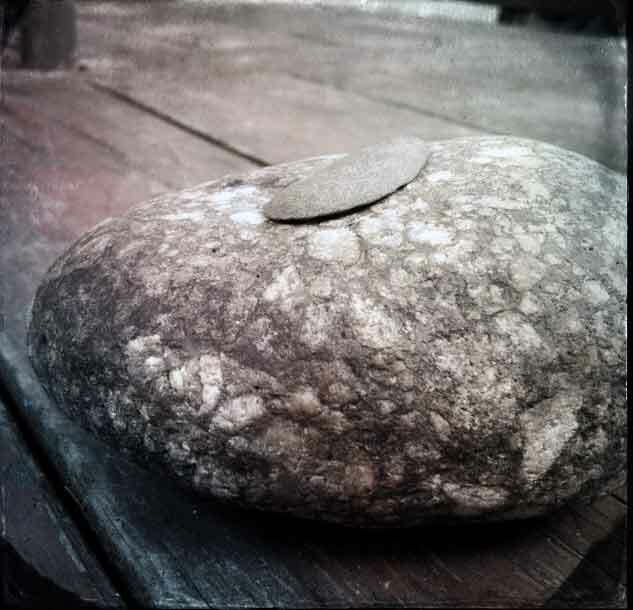 Our outside table is piled with stones, my desk has little heaps of small smooth pebbles, Malcolm’s desk is covered with a ruckus of rocks, and he’s got boxes heavy with many more of them. The washing machine is piled with stones from boys’ pockets. We all collect them, we all bring handfuls into the house. They seem full of meaning and life, with all their weighty calm; they’re so silent and still, but surely they hold old stories and myths and spirits inside of them. I love the cairns throughout our house, marking our paths, showing us where to go and where we’ve been, spelling our time here, commemorating our adventures; so hard to clean around, such a sweet testament to our collective madness. This meal is like a mound of stones! Well, if the potatoes were stones, and if they were covered by a fresh, juicy spicy sauce, and a smooth very tasty aioli on top! I was thinking of the tapas dish Patatas bravas when I made this. 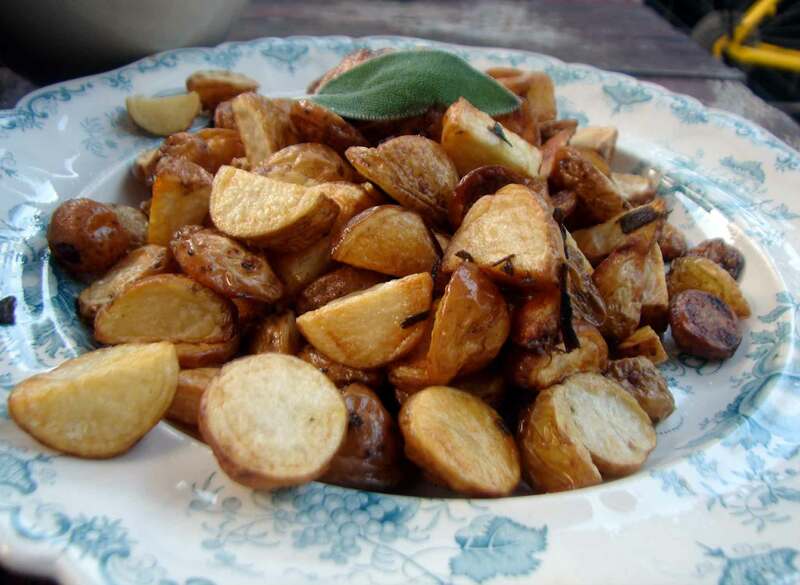 So it’s got crispy sage-roasted potatoes–I used the ones from the farm and they’re tiny, only about half an inch across. If you have larger ones, just cut them into smaller pieces. 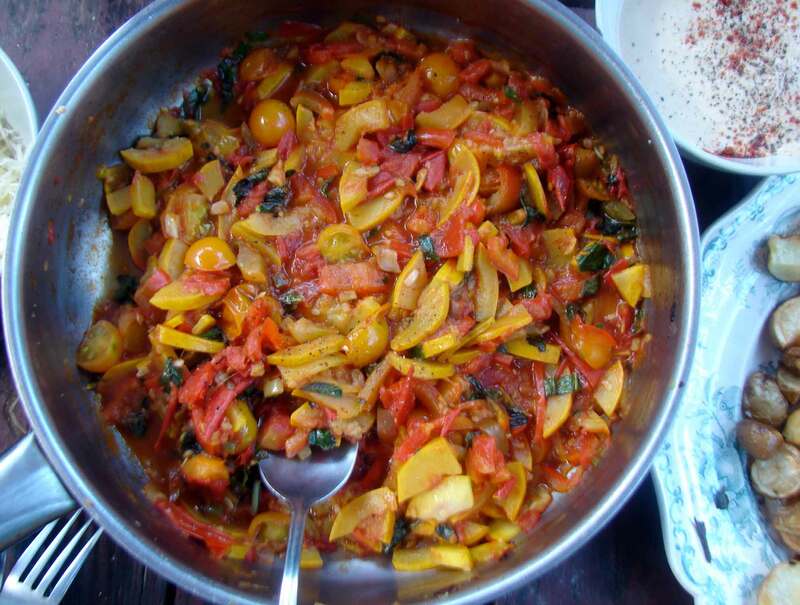 Atop this we piled tomatoes, sweet peppers, hot peppers and yellow squash–all from the farm. 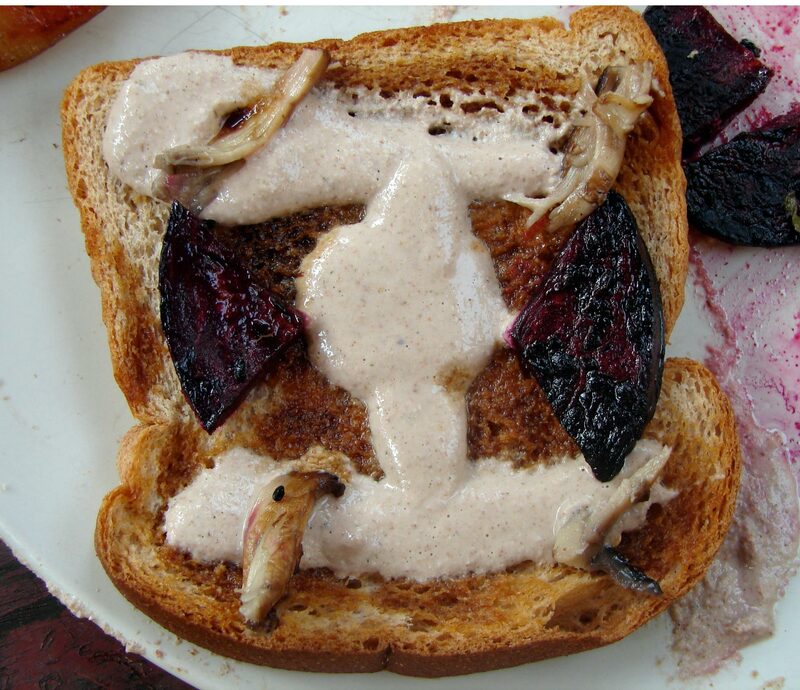 And my favorite part was the pine nut chipotle aioli. Simple but with a smoky haunting flavor. It would be good with any other kinds of roasted vegetables as well, I think. Here’s Bill Evans with Milestones. I have the whole day to myself for the first time since…well, I can’t really remember the last time. “Oh! Miss Woodhouse, the comfort of being sometimes alone!” I had such big plans! I was going to get so much work done. I was going to start a novel, and make some progress on pre-production on this movie I’ve been talking about for half a decade. I was going to be creative and productive! Six hours in, and I’m having such a strangely hard time focussing. I could blame it on the heat, because it is hellish hot, but in truth I think it’s the silence. It’s the complete and bewildering lack of distraction. Why isn’t anybody asking me for a snack, and then ten seconds later insisting on a drink to go with it? How can I possibly be expected to get any writing done if I can’t yell at anyone to stop yelling so that I can get some writing done–if I don’t have the deadline of a trip to the river to motivate me? I’m actually a big fan of aloneness. I think it’s important to be alone some of the time, so that you can pursue the thoughts in your own head wherever they might lead you, so that you can try to figure out all of those things it’s impossible to figure out. It’s one of my tedious mantras that a person should have such a supply of inner resources that they’re happy alone with no distractions for long periods of time. But, as in all things, I believe we need to find a balance. We need other people, and we need to be needed by them. It’s important to have an outlet and a reason for your wandering thoughts, so that you have something solid to tether them to. It’s important to have a sense of community, be it local or international. I’ve been thinking about this a lot, the last couple of days. If we know our neighbors, and understand them and care for them, then we’ll trust them as well. We won’t sit in paranoid solitude till we drive ourselves crazy with hate and rage. And we’ll understand why the actions of a few people acting out of hate and rage will be greeted by an ever-growing community of humans caring for strangers as if they were friends, with generosity, compassion and understanding. Each week I’ve been picking handfuls of fresh herbs from the farm–rosemary, thyme, sage and more sage, oregano, mint, lavender, and summer savory. I generally throw everything together into one big mix of flavors, because this random wildness is part of what’s beautiful about this time of year. But summer savory is a flavor I don’t encounter very often. It’s not as nice dried, and it’s lovely and distinctive–a little lemony and, well, savory! 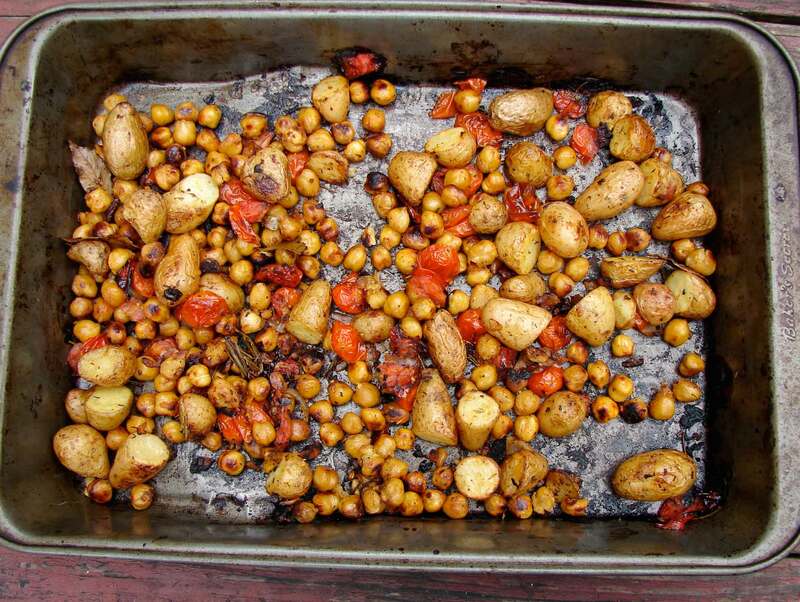 So I decided to use it all on its own in this recipe, roasted simply with tiny potatoes from the farm and big butter beans that were almost as large as the potatoes. I roasted everything in olive oil, and then drizzled some truffle oil on top. 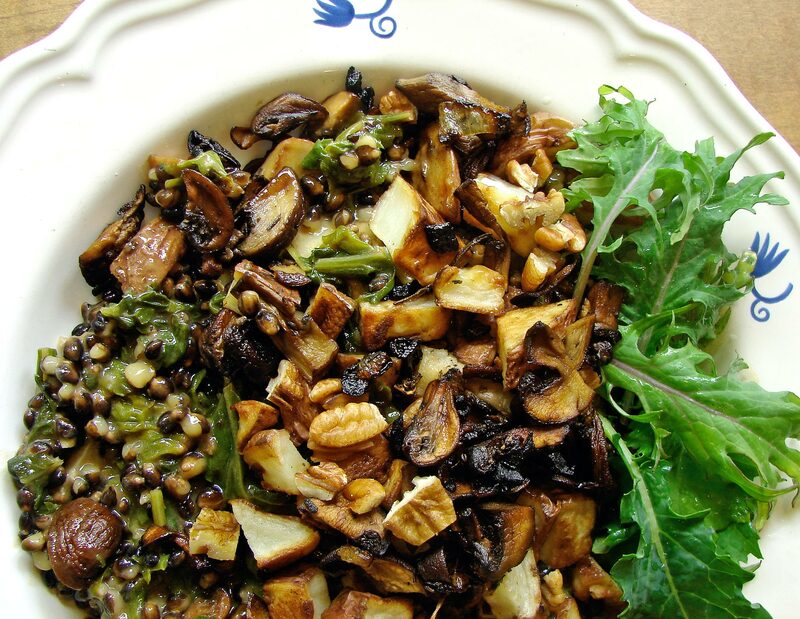 If you don’t have truffle oil, you can leave this step out–it will still be very flavorful! When a child tells a joke (my child, at any rate) he always explains it. He always adds a little, “do you see what I did there?” (Except when they tell knock knock jokes, of course – not because they need no explanation, but because there is no explanation. They make no sense, and that’s the point of them.) As they get a little older they might just send it out there into the world, and see how it plays. They start to understand the universal language of jokes, and they recognize that others understand it as well. And if it plays well, they’ll repeat it, over and over and over again. There’s a regular at the bar where I work. He’s a friendly, loquacious guy, and everybody’s always happy to see him, as befits his status as regular. He tells jokes that aren’t always appropriate, and he lets us know they’re not appropriate by saying, “If you know what I mean.” One day, the bartender said, “Everybody always knows what you mean!” She said it in a jolly, joking way, but he seemed a little chastened. He was uncharacteristically silent for a few minutes. When I think about it, which I frequently do, it’s so odd that we can communicate at all. Words are so frustratingly, beautifully inadequate. Either they seem to have no meaning at all, or they have so many meanings you don’t know which to choose. We could lose ourselves in the space between what we mean to say or what we want to say, and what is actually said. We watched Tokyo Story by Ozu yesterday. (Beautiful!) His films are about regular, contemporary people facing problems that we all face, and one of these is, simply, talking to one another, conveying meaning. The characters are speaking Japanese, of course, which is a language I don’t understand, but they’re so clearly sharing the difficulty of sharing, with their gestures and expressions. They use small sounds, single syllables or grunts, that seem to carry more meaning, and be better understood, than whole streams of words. I love this! Each person fills the syllable with their own inflections, the whole force of their personality. Ozu will show one side of a phone call that consists of nothing but these short grunts, and you know what the person on the other end is saying. I read a little bit about these sounds, and they each have their own written character, which is a beautiful thing. I suppose we have something similar in English, but our small sounds, our ums and ers and uh-huhs seem to create little spaces of non-meaning, little expressions of frustration with meaning. Or maybe it’s just easier to see meaning when you’re less entangled in the words, when you’re outside, looking in. It’s funny how recipes can become construed and misconstrued, made up, as they are, of words. The symbols I take as universal are very confusing to some people. And measurements are so changing and mysterious, especially when you’re talking about the size of a vegetable! In recipes such as this one, it’s okay that the measurements are vague. You can adjust the amounts to your taste. 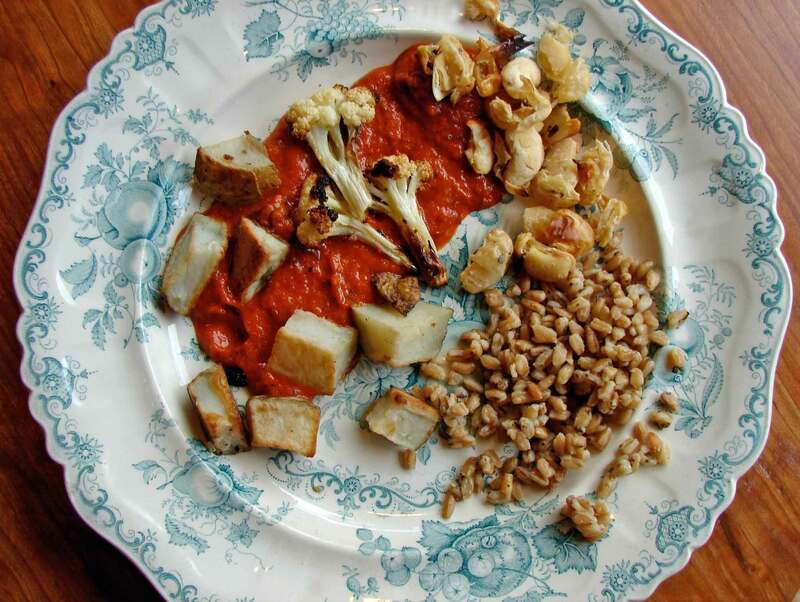 We have roasted potatoes, cauliflower and roasted butter beans (yummy!) And we have a sauce to toss them in, and you can roast just as much of each as you like! You can mix everything together, and fry it in a skillet till the sauce is fairly dry and coating each piece, and that’s tasty. Or you can leave the elements separate, and let people take what they like, which is what we did, because not everyone in the family is as enthusiastic about cauliflower. We ate this with simple herbed farro, and some sauteed kale and broccoli rabe tossed with lemon and butter. I know I shouldn’t go on about it, but it’s on my mind. My dog died a couple of months ago. I still miss her everyday. I still look for her each morning, where her bed used to be. I dream about her incessantly. I’ve dreamt of her as a puppy, I’ve dreamt that she’s lost or not well, and I can’t save her, I’ve dreamt that she never died at all. The strangest dream was probably the most like actual life. She died, and I missed her, and it felt so unaccountable. Why do the most literal dreams feel so odd? I don’t want another dog, I really don’t. But I miss canine companionship. Our house feels so human, somehow, without her. The other day Isaac said, “Mom, you can’t just go up and pet every dog you see!” And he’s probably right, but that’s what I’ve been doing, and trying not to think that Steenbeck would have gone crazy if I’d gone home smelling like another dog. So yesterday, when I went to get the boys from school, and I saw a tiny, dark, bundle of puppyhood…I attacked it. I dropped everything (literally! it’s lucky no little children were standing below me because my umbrella is quite pointy). I grabbed it. Oh, the soft, round little belly. The hot little body, the racing heart. The little puppy eyes and ears! The puppy smell!!!! She didn’t really want to be held by me – she wanted to be running around, with the kids her own age. But I wasn’t taking the hint. I couldn’t let her go. My boys looked at me with sideways, skeptical looks. “Who is that?” they asked? The little kids who actually owned the dog danced around me, looking anxious. “When is she going to give it back?” they asked their nanny. Never! I cried. But I did. I put her down. The little dog was sort of blacky brown. She had that short, dark fur that looks almost purple or blue in certain lights. In other words, she looked like black barley. You see? There is a connection. Barley would be a good name for a dog, wouldn’t it? This black barley dish is almost like a risotto, but like a risotto made by a very lazy person that didn’t want to make a broth or stir it every minute of the day. The barley is cooked till it’s tender but toothsome (if that means al dente). And it makes its own creamy sort of sauce, just like a risotto. I warmed some butter and white wine and herbs in a big frying pan, and added the barley with its creamy broth. Then I added some water and let that cook down a bit. I found baby kale at the grocery store, and I was quite excited about it. It does have a kale taste, but not as assertively. It has a little bite. 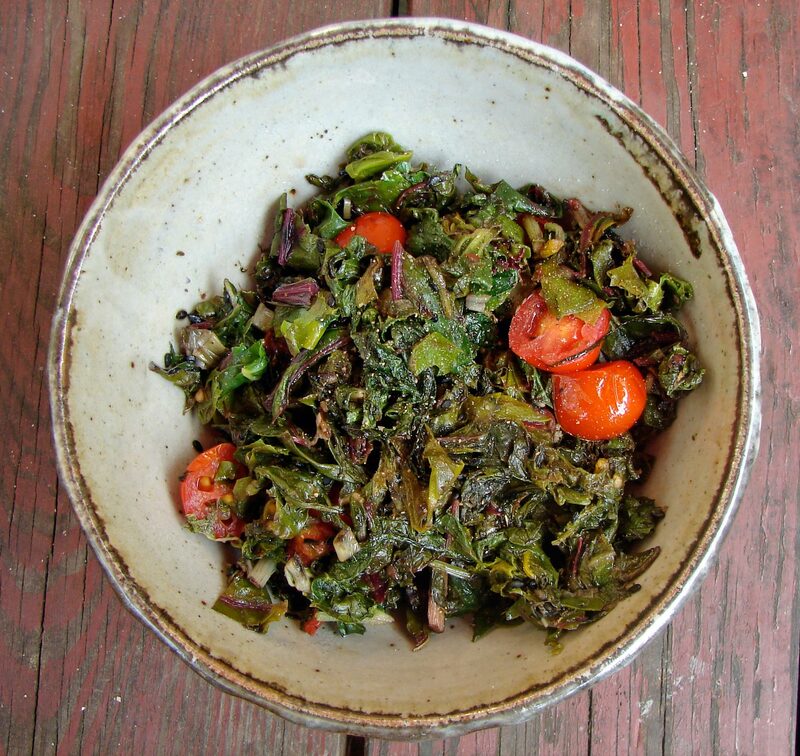 I cooked it for much less time than I usually cook kale – I tossed it into the barley broth towards the end, and cooked till it was nicely wilted. (You could easily use regular kale, cooked first, or baby spinach, which wouldn’t need to be cooked at all.) 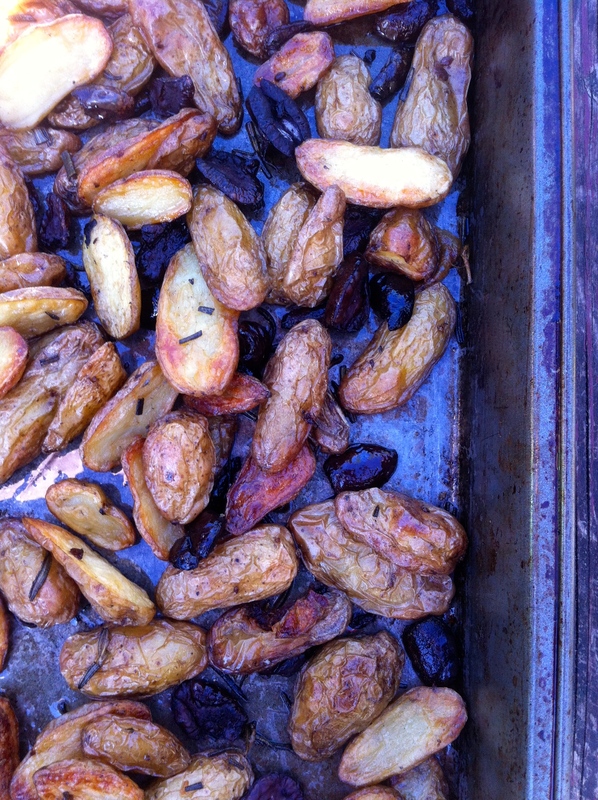 I also made roasted mushrooms and tiny crispy roasted potatoes, to toss on the dish. And I toasted some pecans. 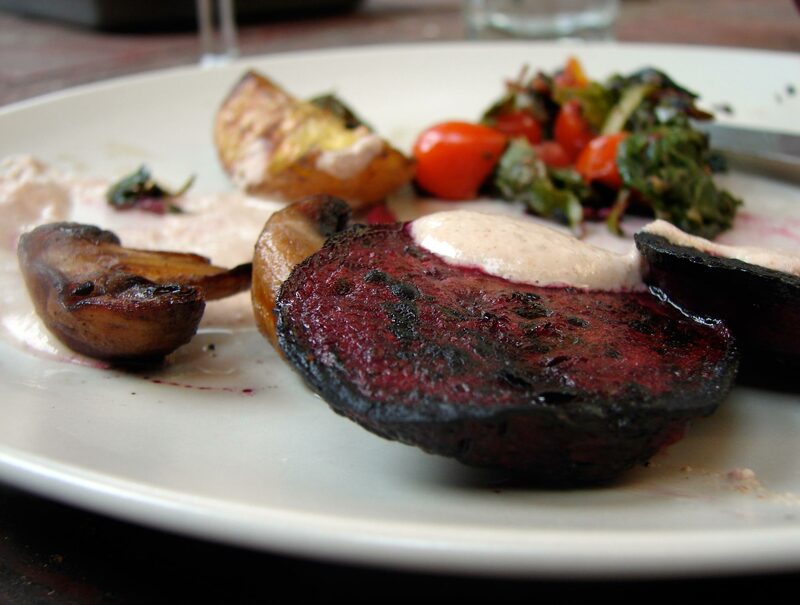 I like all of these tastes together – and they all go so well with sage, rosemary and thyme, which I used to flavor pretty much every element involved. I topped mine with some crumbled bleu cheese, too, which added a lovely creamy/salty element, but nobody else in my family did, cause they’re not fans of the bleu cheese. The whole thing added up to a very savory, meaty meal – the smell of barley and roasted mushrooms lingered in my house all evening. It’s a nice smell! Here’s Rebecca Sugar with Sleepy Puppies. I think it’s lovely! I had the strangest moment yesterday. I went to buy a loaf of bread on a balmy spring evening. A time of year and a time of day that you can feel things changing all around you. I saw a boy walking toward me on the street. He’s very tall, taller than me, and I was hit by a powerful memory of seeing him asleep in a crib ten years ago. We were living in Boston, but planned to move to this town, and his mother was showing us around the apartment that would be our home for two years – all through my first pregnancy and the first year of Malcolm’s life. I thought of how hopeful we were then, and how different. I thought of how happy we’d have been to know we’d be living here now, and to know about our boys. I imagined myself then, seeing myself walking down the street on a spring evening, feeling so at home. And I thought about my dog, who had been such a good friend to me at that time, and who had been very well-behaved when we met our future landlady, and who died a month ago. It was such an odd, slowly-passing moment, which combined the past and the present, the present as the future. It hit me hard! That moment of tension, the feeling of things changing, is what makes spring and fall so exciting – why they make you feel alive. And now, you’re wondering, how is she going to make this about potato salad? Well, friends, this potato salad is like an edible little mix of contradicting factors that work well together. 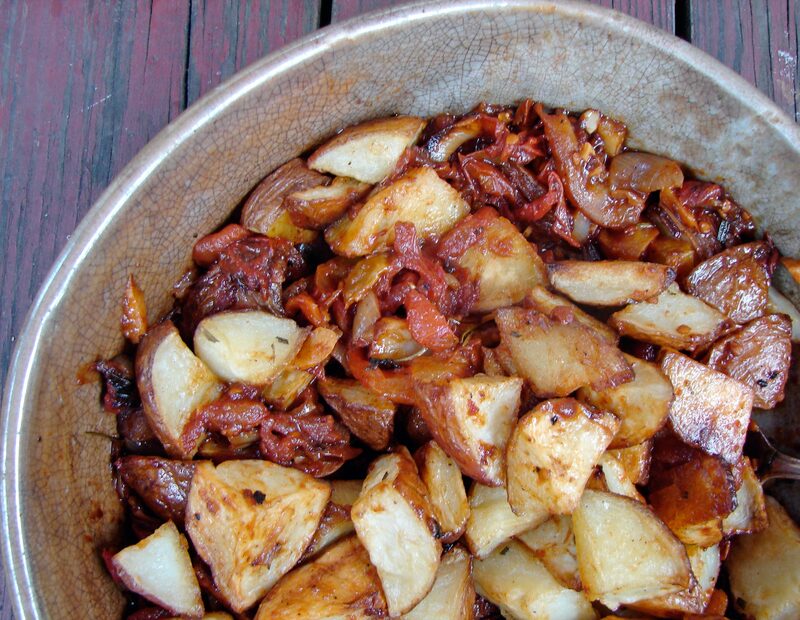 Roasted potatoes are such a cool weather food, arugula salads so warm weather. The warmth of the potatoes contrasts with the coolness of the arugula, and even wilts it slightly. 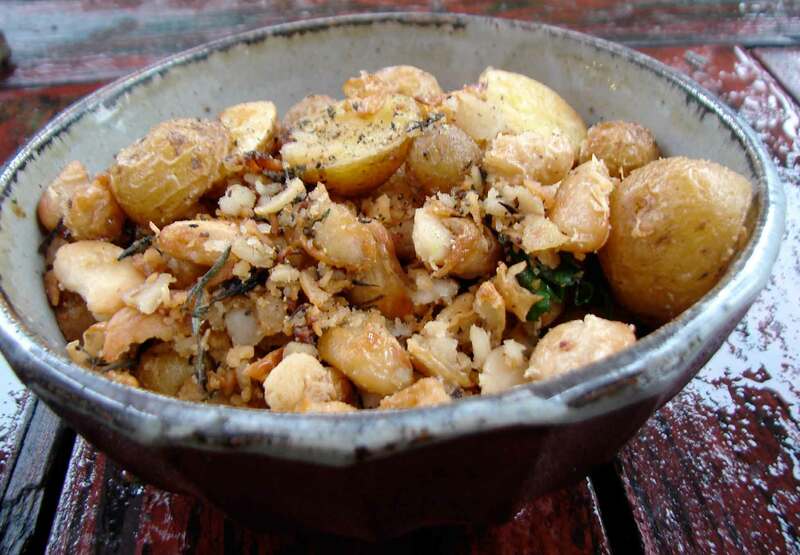 The potatoes are pleasantly soft, the pecans and roasted lentils delightfully crispy. 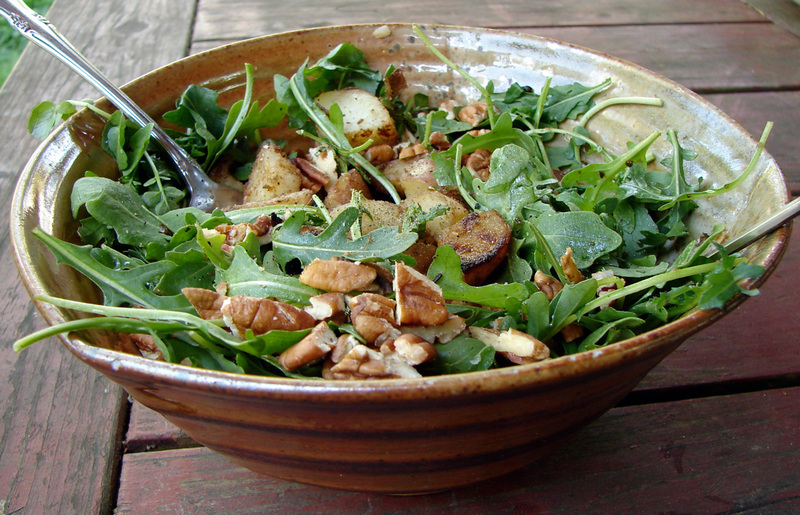 And the mellow sweetness of roasted honey and balsamic plays against the peppery sharpness of arugula and water cress. Ta da!! Here’s Cymande with Changes. A remarkable song!